OneWorld U.S. has brought together a group of experts (disclosure I'm one of the experts) that can help you answer some of your questions around communications, fundraising, technology and other issues. You can submit your questions and the experts will pick and choose the questions they can answer, and post their response to the blog. Others in the OneWorld community are also welcome to share their expertise and post their suggestions. via Amalyah Keshet and Wired Magazine "Hijacked Disney Characters Explain Copyright"
The "Magritte and Contemporary Art: The Treachery of Images" exhibit at the Los Angeles County Museum of Art manages to both celebrate and betray fair use at the same time. Inside, they've hung many of Magritte's famous works, and, accompanying these works, they've placed dozens of contemporary sculptures and paintings that riff off of Magritte, making fun of him or paying homage to him or commenting on him. These are canonical fair uses -- an artist who takes from another artist and uses his work to make new work. The pro remix message: Culture is well-served by liberal rules that let one person remix another's creation. The anti remix message: The exhibition policy on photos: no photos are allowed in the exhibit. If you take out your camera, one of the bowler-hatted guards will come up to you and shout at you (literally shout at you! ): "No photos allowed!" They won't even let you take out a phone or PDA and make notes with it, in case you're sneakily taking photos on the premises. This is a riddle: does the Magritte exhibition celebrate fair use, or deny it? Does it want to inspire us to remix Magritte, or warn us off the idea of reproduction without permission? At first glance, the article contains quite a few mistakes regarding legal issues. Yes, that's the problem with the fair use concept as currently expressed in the US copyright code, but that's another article altogether -- one that should be written by someone who does their legal research a lot better. While I sympathize with the fair use spirit of the article, one has to get one's facts right in order to make a decent argument for ...anything. I'm pretty pro-CC and free-use in most cases, but as noted above, museums don't always (or usually) have the option to make everything fair-use. It's really out of our hands. And so I find it intensely frustrating that a lot of copyfighters insist on blaming the museum for copyright on artwork. It undermines public perception of the museum as a publicly-funded space, with numerous complaints by photographers about why a public institution doesn't allow the public to photograph within modern and contemporary art galleries. Is the subject of the photo copyrighted? If the photo is of, say, a TV screen showing a newscast or a newspaper page showing a staff photo, then you still might be liable for copyright violation despite the terms of the CC license listed on Flickr or elsewhere. Does the Flickr user really have rights to the image? Unfortunately, many Flickr users post to their accounts images that they did not take and don't have permission to use. In that case, their CC license is invalid. If you're not sure, ask before using. Is the image genuine? Remember, any photo (even from allegedly reputable pro photojournalists) can be faked or altered. If you have doubts about authenticity, investigate before running the image. Protect yourself. Save or print the screen where you found the photo that shows the CC license notation. (Furl is a great way to keep such evidence.) That way, if the photographer later tries to revoke the CC license, you can show it was in effect on the date you published the photo. Whenever you use a CC-licensed photo that you find on Flickr or elsewhere, it's a good idea to leave a comment or send a note to the photographer thanking them and giving the link to where you ran it. That's more than just being polite -- it also can prevent criticism that you're exploiting unsuspecting amateurs. In photography, as elsewhere, appearances count. Although some say that the spirit of the "by" is to eliminate the both of asking permission because it is given via the license. See Amy's coverage of the Lisa William's pressthink piece about the first newspaper chain to use the creative licensing. As was the buzz last night at the CC Birthday Party, Larry Lessig has done so much to inspire this shift from a culture of protection to a culture of sharing. Last week when I blogged that won the Creative Commons flickr photo contest, the prize I got was Lessig's on my answering machine. And, I just got an even better gift. In today's email, J Wynia, shared with me a tool he created with the Flickr API that lets me search for interesting photos that I can remix or use and automatically generates the attribution. Yeha! Given your recent discovery of the "by" CC license and your recent inclusion of photos under that license from Flickr on your posts, I thought you might like to know about a tool I built a while ago that searches through Flickr CC-licensed photos based on "interestingness". I use this tool to find pretty much all of my post photos. This is the value I get from blogging - the ability to connect with other people around a common interest. Yet, I wonder if this is a compelling enough reason for those work in nonprofits? We keep running into each other in many different places. 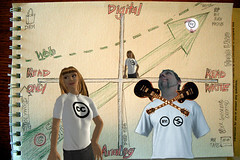 Mike is writing some great stuff on remix culture and creative commons license. Mike isn't doing this particular mashup for fun, he's trying to move forward some debate about methods and issues with specific licensing uses for mashups. Read his comments here. Set your content free - don't use anything more restrictive than Creative Commons attribution (beware the sting in tail of share alike). Remember the aim is to have your content turn up in searches for media that is suitable for remix. The less control you try to impose on future derivatives of your work, the more likely it is to get remixed. He goes to muse about the differences in CC licensings and impact on remix culture. I'm beginning to wonder if Creative Commons offers TOO MUCH CHOICE. While it is crucial to move from the copyright default of 'all rights reserved' to the CC default of 'some rights reserved' there are problems whenever we try to control (and therefore restrict) future use of anything digital. I am not sure what the future of media licensed with options like 'no derivatives' or 'share alike' will be. It is just too risky for creative people to work with this stuff because sooner or later down the re-mix chain there is bound to be an unforseen future use that is prevented by these restrictions. 2. Stephen Downes replies here. I use a 'non-commercial' license on my stuff because I don't want some company pulling a Blackboard on it - using it commercially then turning around and claiming it's their property. Note that commercial entities can use the content if the use is non-commercial, and nothing prevents me from allowing commercial uses in parallel (it's my own content, after all). As you may know, Stephen, the non-commercial clause is considered harmful (google for it) - it is often quite difficult to decide whether some activity is commercial or not. Is teaching in a public school commercial activity? How about a private school? University? Study circle? Student creating a presentation in college? 3. Mike responses with this post. I think Creative Commons has the potential to unlock exponential growth in the value of the Read/Write cluture, shaped by expressions in the new languages from digital multimedia ReMix and Mashups - but only if used skillfully. WHY did I remove ‘Non Commercial’ from my default Creative Commons license? Because I figure the RISK of my digital work never being discovered/re-mixed outweighs the RISK of being ripped-off (cheated out of money I deserve) or having some evil corporation ‘do a blackboard on me’. I thought long and hard about my previous default ‘Attribution, Non Commercial’ license. The work I did for LearnDog seeks to publish and promote digital work by kids with a view to maximising the recognition for their work as it flows freely (freedom) through the read/write web without creating any impediments to them generating income (not free beer) in the future. My first inclination was to add ‘Share Alike’ to ‘Attribution, Non Commercial’ in what turned out to be a naive attempt to preserve this ‘pure and wholesome’ license regime in perpetuity. We very quickly discovered that ‘Share Alike’ was a barrier preventing work from being re-used in many interesting scenarios that we hadn’t predicted. The point of this post is not to try and persuade you that I am right but to start some debate that will help us all sharpen our Creative Commons skills. I did one more mashup of this one to help summarize this debate that I'm trying to understand. 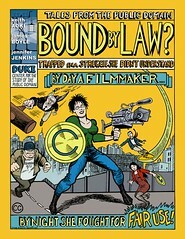 Direct Link to "Tales from the Public Domain: Bound By Law"
Museum, Education, and Library IT networks have special interest or affinity groups on the topic of copyright and fair use. The MCN (Museum Computer Network) Intellectual Property Special Internet Group is chaired by Amalyah Keshet. There is a good list of resource materials at the site, including a link to the Documentary Filmmakers Statement on Best Practices in Fair Use from the Center for Social Media that Michael Hoffman pointed to in his post on fair use. 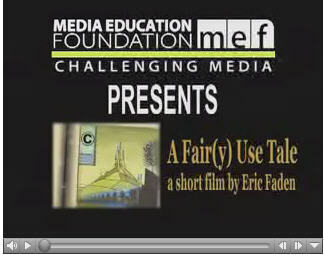 The site also has a blog on the topic of fair use. This YouTube video is from Kenneth Goldstein and it's hilarious. On the serious side, I wish there were some clear guidelines about what exactly is fair use in the nonprofit space. Don't I get to reprint an image without permission under the "fair use" doctrine? While "fair use" is a somewhat nebulous term — and subject to interpretation — it refers to the things you can do with an image without permission. In general, it may be considered fair use if you are reproducing a work for the purposes of criticism, comment, news reporting, teaching, scholarship, or research. The purpose of the work, including whether such use is of a commercial nature or is for nonprofit educational purposes. Keep in mind that penalties for knowingly violating U.S. copyright laws can be severe; if you have any question as to whether something constitutes fair use, err on the side of caution and double-check with the copyright owner or consult an attorney. is in a great position to connect nonprofit technologists with legal copyright/fair use SME's on this issue and helping nonprofits technologists navigate the world of Fair Use and Copyright Laws. A few resources to explore, including the Fair Use Network via the Museum Computer Network (btw, the museum world is very on top of copyright/fair use issues. Michael Hughes also mentions the Center for Social Media as a good resource.